The Smart Fabrics Program and E-Textiles Workshop at the IFAI EXPO in New Orleans, which ran September 26 – 29, took a hard look at smart fabric development and commercialisation. The Smart Fabrics Track was part of the Expo’s Advanced Textiles Conference and included lectures, roundtable discussions, and exhibits that examined both the challenges and opportunities for the development and commercialization of smart fabrics. Case in point: two years in development, the Levi's® Commuter™ Trucker jacket recently went on sale, featuring touch controls woven into the cuff which allow the wearer to receive phone calls, navigate, or play music without getting your cell phone out of your pocket. Developed in conjunction with Google’s Advanced Technology and Projects Group (ATAP), the jacket sells for USD$350, and can only be washed ten times before the circuitry is damaged (according to The Guardian). The jacket’s touch-sensitive denim fabric, woven with conductive threads containing a copper core, allows you to communicate wirelessly with your phone via a detachable Bluetooth dongle. But while the jacket will appeal to cool-hunters, does it really answer a consumer need? While Mease put the world market for smart textiles at USD$2.75bn in 2016, (USD$1.67bn in the US alone), it’s possible that much of the hype is unjustified. In fact, some presenters described smart textiles as being in “The Trough of Disillusionment” on the Gartner Hype Cycle, a graphed representation of technology development and adoption developed by the Gartner Research technology and advisory firm. “No one in this industry is making any money because there is not yet a market need,” he continued. Jur believes that the best use-cases for smart textiles lie in the health care market, where standards and reliability are critical. “The words ‘wearable tech’ will go away,” stated Ben Cooper, managing director of IOClothes, who nevertheless believes that the future of apparel, footwear, and textiles is tied into the development of the Internet of Things (IoT). Cooper’s company is focused on being a catalyst in bridging the gap between technology and textiles. “The two industries do not speak the same language,” he said. While the textile value chain is long-established, the traditional manufacturing scenario does not necessarily work well for smart fabrics and e-textiles. “What we are doing now is merging two industries. We need to have a conversation,” insisted Eva Osborne, VP research and innovation for smart textile incubator Significant Difference, and lead E-Textiles Workshop host at the IFAI EXPO. Connie Huffa, whose firm Fabdesigns develops performance and smart fabrics for footwear, military, medical, and aerospace clients, explained that smart textiles need to be designed from the polymer forward. “We build the fabric along with the product.” She also cited a need for knitting machines that can produce the innovative structures required to design smart products. Judging by the exhibitors in the Expo’s Advanced Textiles Sector, some of the textile value chain is getting the message. Conductive yarns and threads from Marubeni Electro-Yarn and Supreme Corporation’s VOLT Apache yarns can be incorporated in textile substrates to provide conductivity. Variation in materials, including copper, stainless steel, silver, or carbon, as well as with metallization technologies, allow the properties of such yarns to be fine-tuned, according to McDermid Enthone Industrial Solutions. While conductive threads can be knit, woven, sewn, or embroidered into textile substrates, printed textile circuits using electronic inks or pastes are said to hold great potential. DuPont Intexa™ screen printable inks of silver, carbon, or silver-chloride can be placed on TPU film in intricate patterns, then laminated to the fabric to create pathways to a circuit. The resulting e-textile is super flat, light weight and stretchable. As for textile machinery, Stoll’s Performance+ collection illustrated the capabilities of its recently developed CMS ADF technology. The flat-bed knitting machine’s 3D shaping, goring, weave-in and selective plating applications enable the precise placement of conductive yarns, chips, and battery pockets into fully-fashioned performance knitwear, along with the body-mapping of mesh and compressive structures. The STOLL machine CMS ADF 32W technology has been chosen by the Advanced Textiles Research Group at Nottingham Trent University, led by Professor Tilak Dias, for future research and development. “The ability to create e-textiles using computerized flat-bed knitting technology, such as STOLL CMS ADF 32W, would influence the textile value chain,” said Dias. 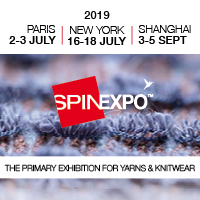 Machines are also at the heart of Gehring-Tricot’s success, with a full spectrum of warp and weft knit and stretch weaving machines, along with the company’s willingness to adapt to non-traditional applications through yarn and structure innovation. “We are seeing more customers looking for textile matrices to support their e-textile development,” claimed Bill Christmann, VP sales and marketing for the company, based in New York State and Fall River, Massachusetts. The development of standards and IP protection for smart textiles have many in the industry perplexed. Washability, consumer safety, sustainability and the reliability of medical and military technology are critical issues. “Designers just want to jump in—but it’s not that simple,” Huffa pointed out. “Some designers want to put copper fibres right into fabric. Electronics can do things to your immune system, and graphene is toxic to the body.” In addition, e-textiles may not be recyclable, with batteries adding toxicity. The American Association of Textile chemists and Colorists (AATCC), ASTM International, the Institute of Electrical and Electronics Engineers (IEEE) and the Association Connecting Electronics Industries (IPC) have begun to grapple with the problem. In addition, Elman pointed out that patent law can be very difficult, particularly in partnerships between industries as diverse as textiles and technology. The successful commercialisation of smart textiles relies on finding a need, enabling the textile infrastructure and electrical components to work together, and establishing appropriate standards. Despite the challenges, smart fabrics and e-textiles may provide stimulus for a tired textile industry churning out commodity fabrics at pennies per metre. Beyond current developments for military and first responders, medical and health care, and sports and fitness lie untold opportunities in mass transit, industrial and commercial end uses, energy harvesting, and smart mechanical textiles.